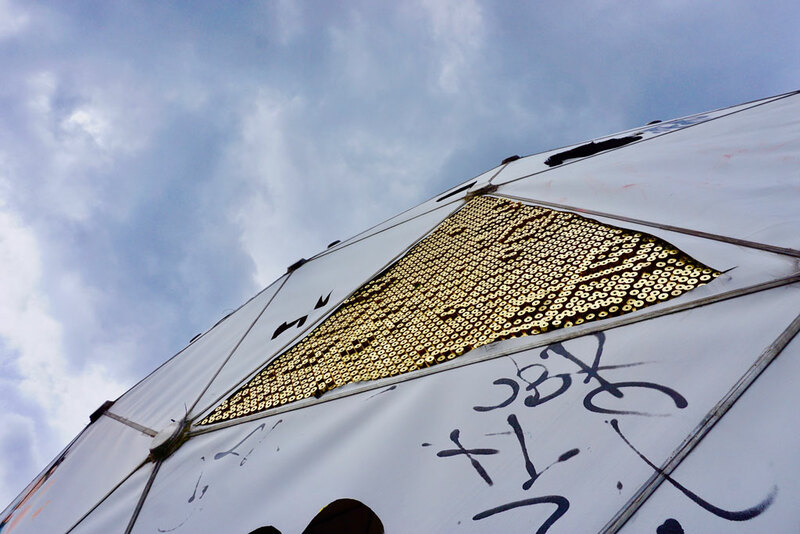 Hunting cartridges exploded and drilled, metal plates, golden paint. 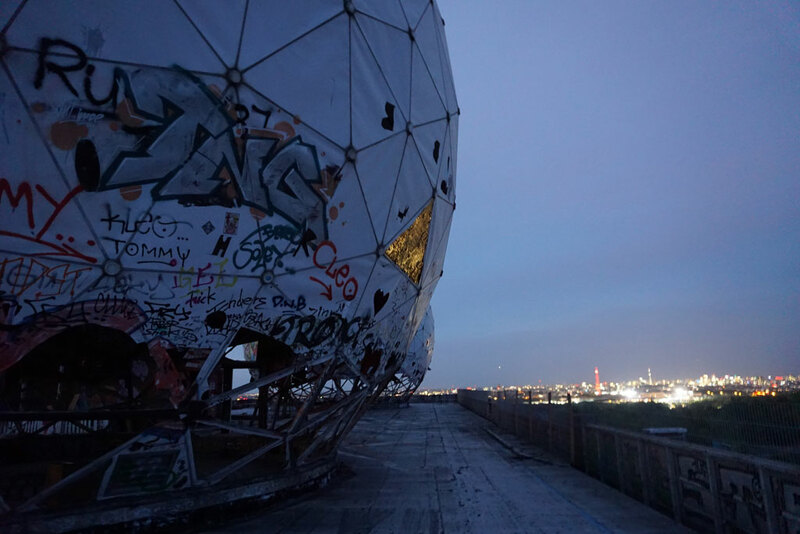 Produced with the support of Teufelsberg team, Horst-Steel, Institut für Alles Mögliches. 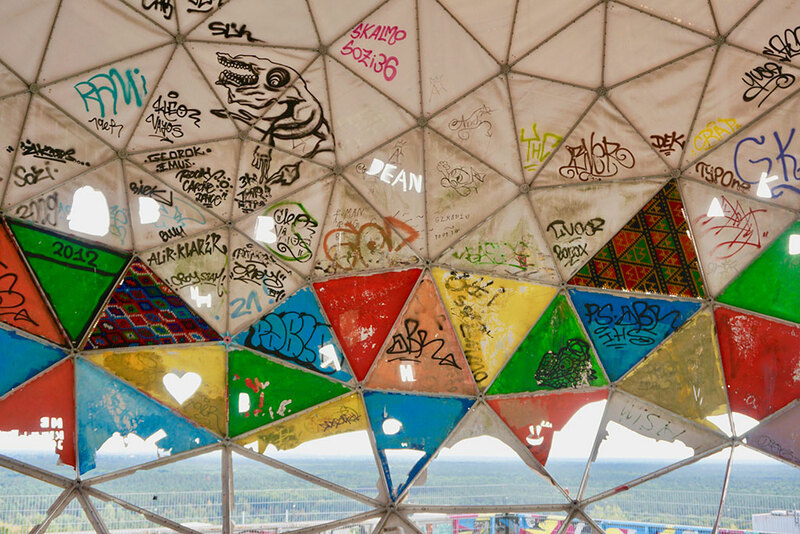 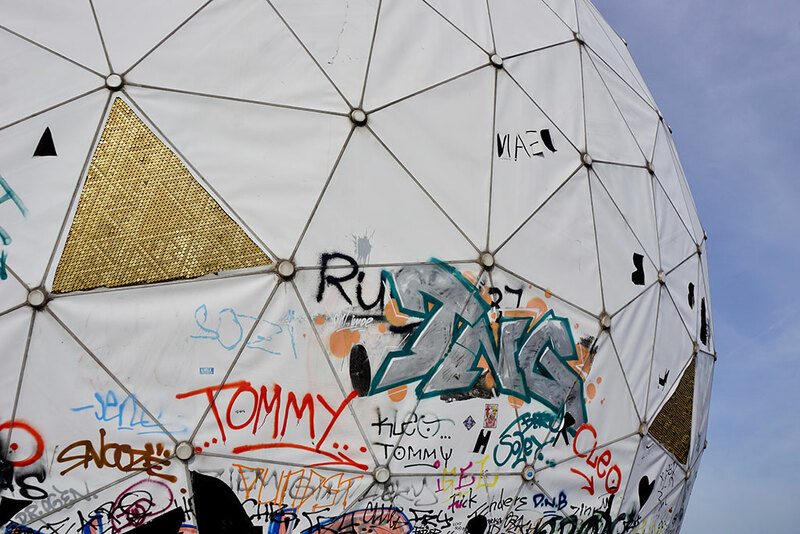 Teufelsberg is an artificial hill, West of Berlin, that’s been assembled bit by bit from the 21 cubic meters of rubble cleared out by the Trümmerfrauen ( literally: women of the rubble ) after the WW2 bombings. 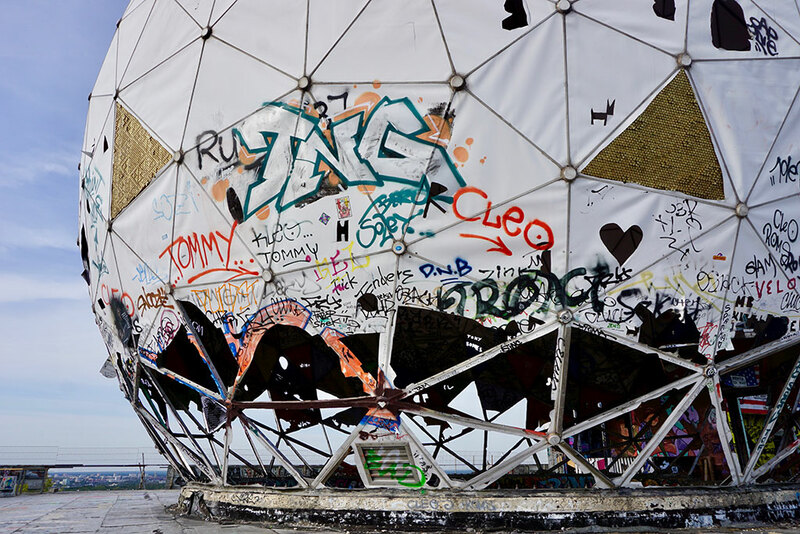 In 1957, the NSA ( National Security Agency ) has built a surveillance station on top of that hill, which was nicknamed « the big ear ». 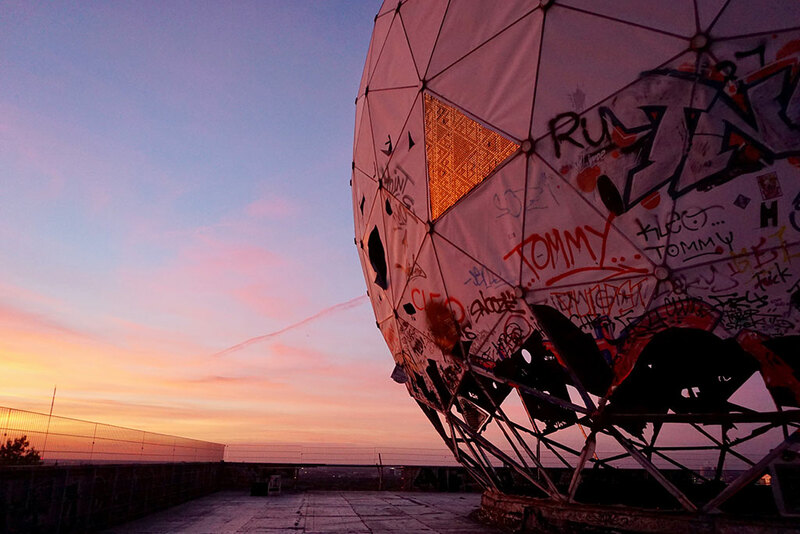 Operated over 20 years by American and British forces, it’s picked up the electromagnetic waves coming from the USSR and the GDR. 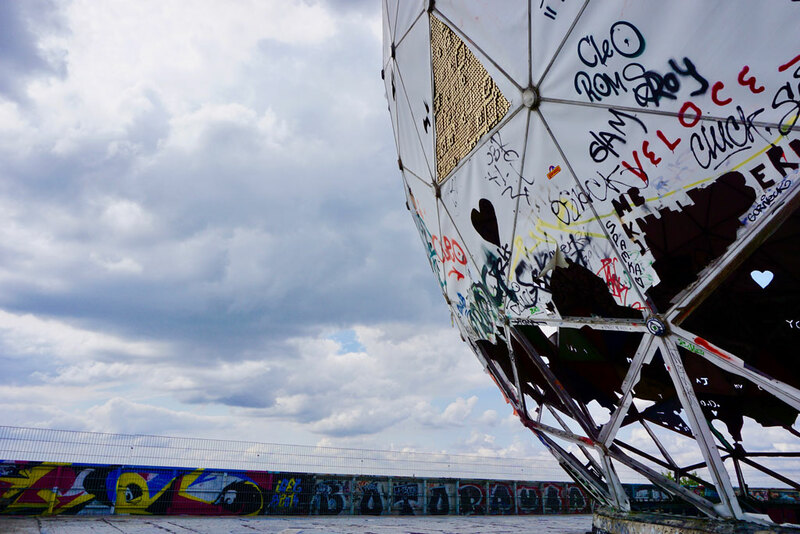 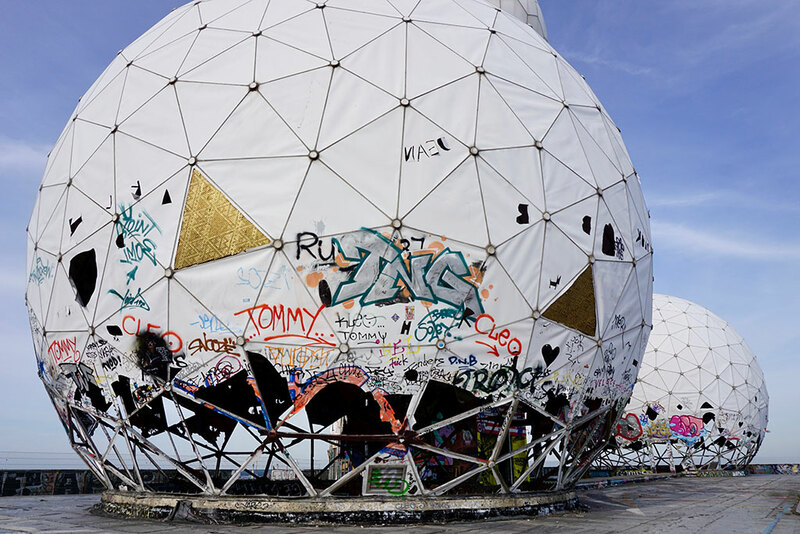 5 radomes remain from this vestige of the Cold War, looking like some sort of geodesic balls. 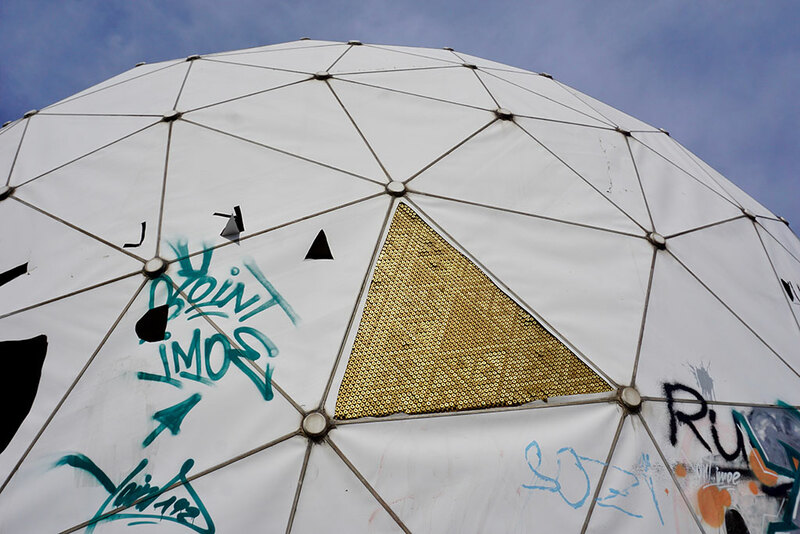 Over the time, the white tarps that used to cover them and hide the orientation of the antennas have been teared, ripped open, bursted. 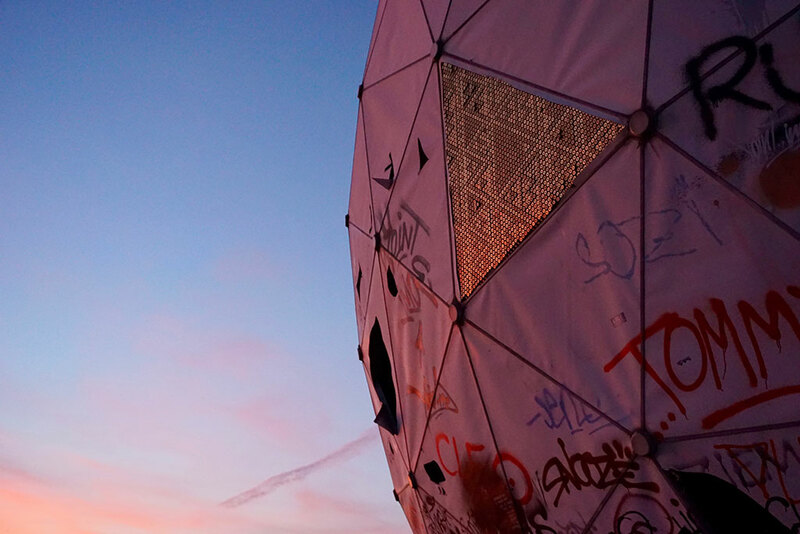 The Electromagnetic Shielding project aims at repairing 5 stripped off triangles, thanks to hunting cartridges embedded into metal slabs. 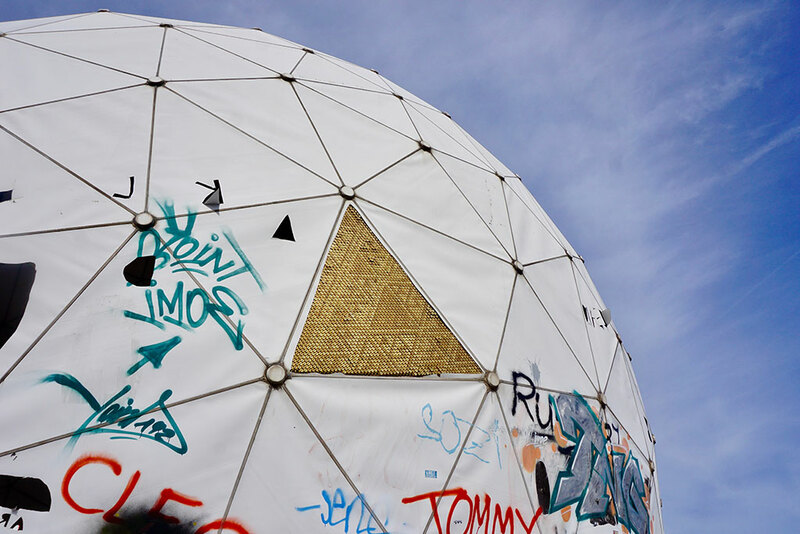 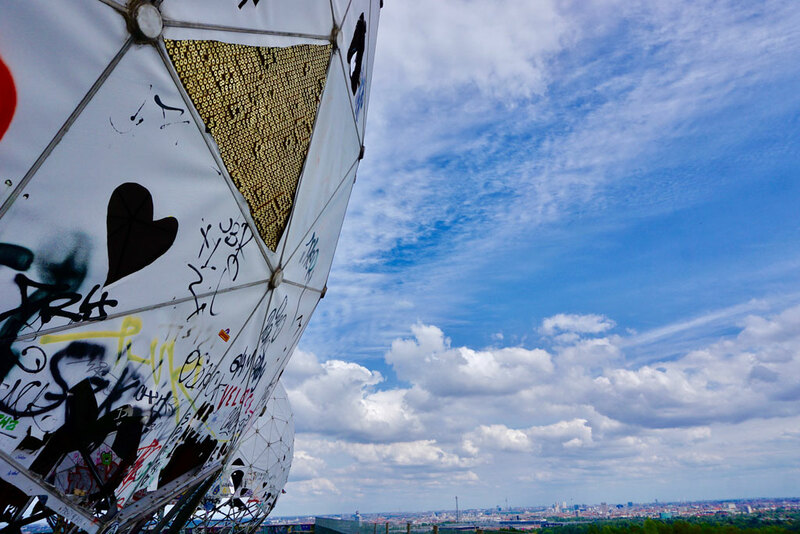 From the outside of the radomes, the appearance of those triangles inspires itself from the electromagnetic shielding plates that constituted a sort of Faraday cage blocking the electromagnetic fields. 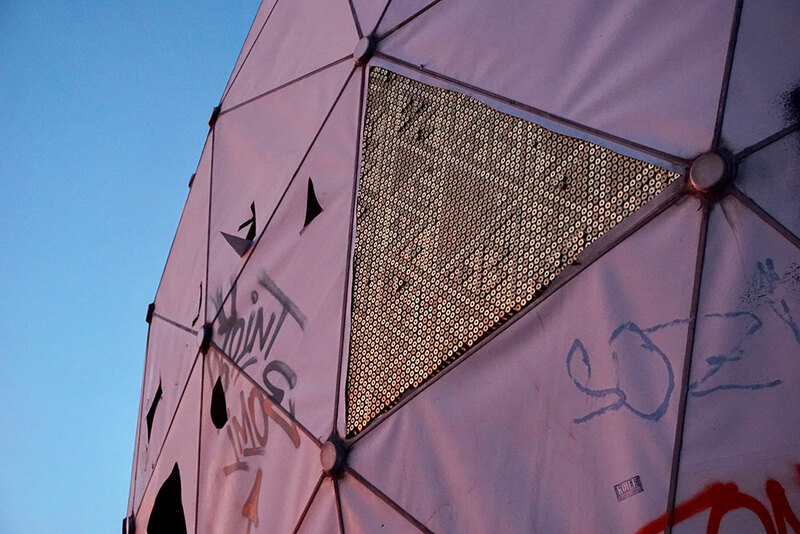 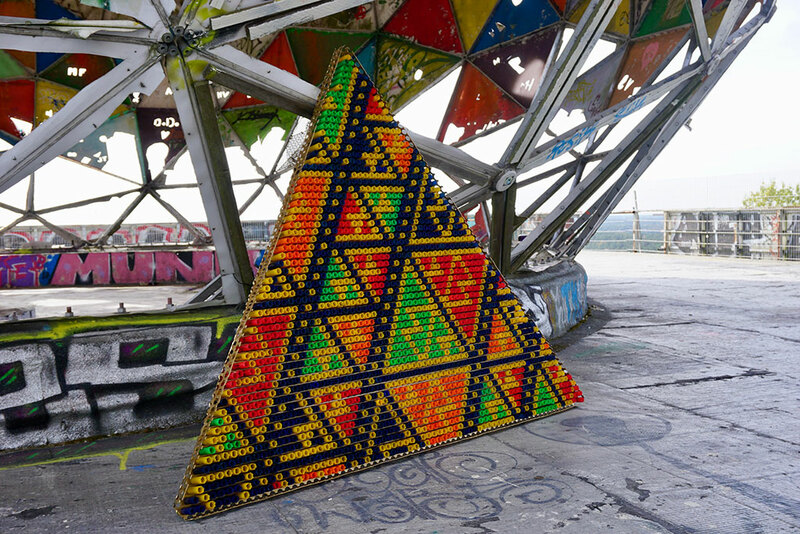 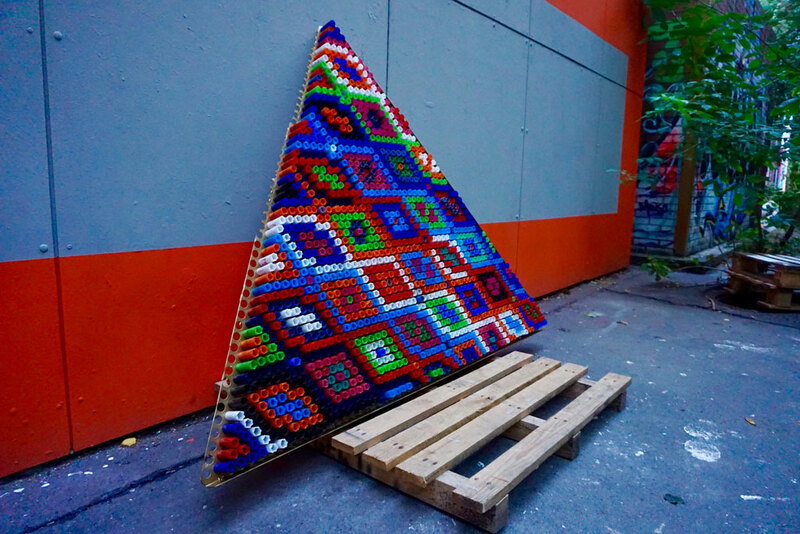 From within, each triangle offers a pattern inspired by traditional textile ones from the 5 continents, as a tribute to the worldwide Trümmerfrauen that clean and rebuild cities after conflicts. 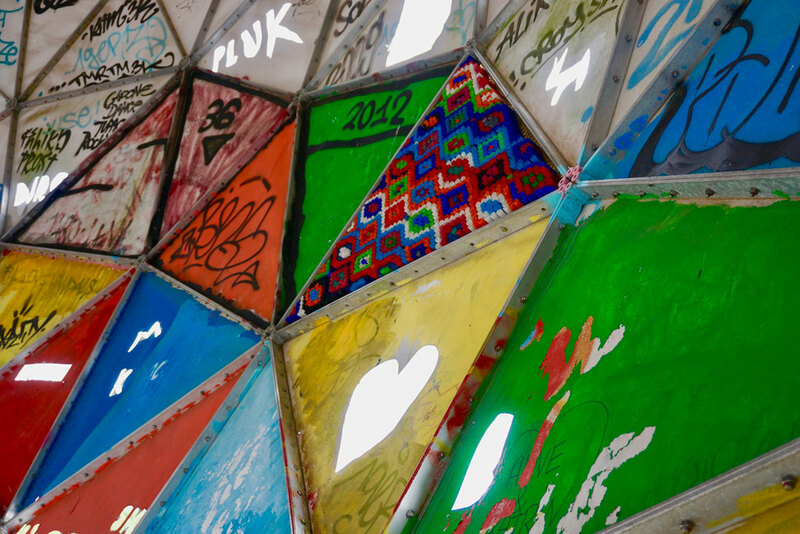 The brilliance of the triangles on the outside and the colorimetric intensity of the patterns on the inside, evolve with the brightness of the day. 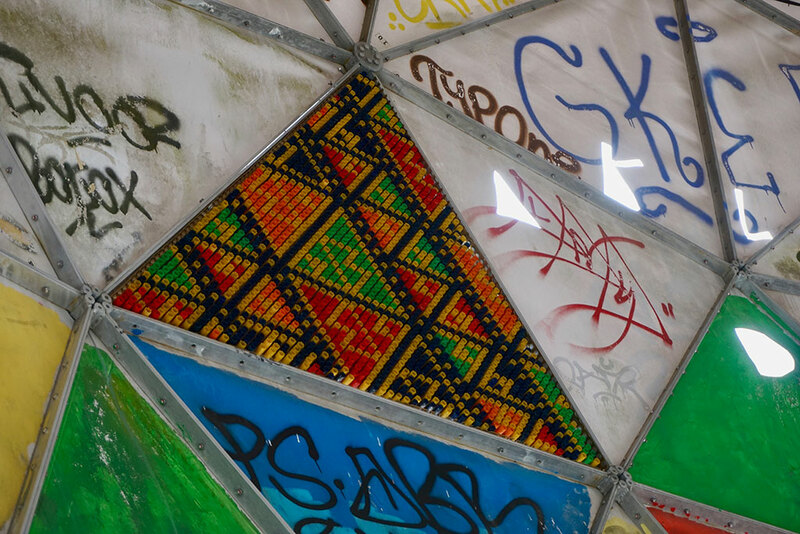 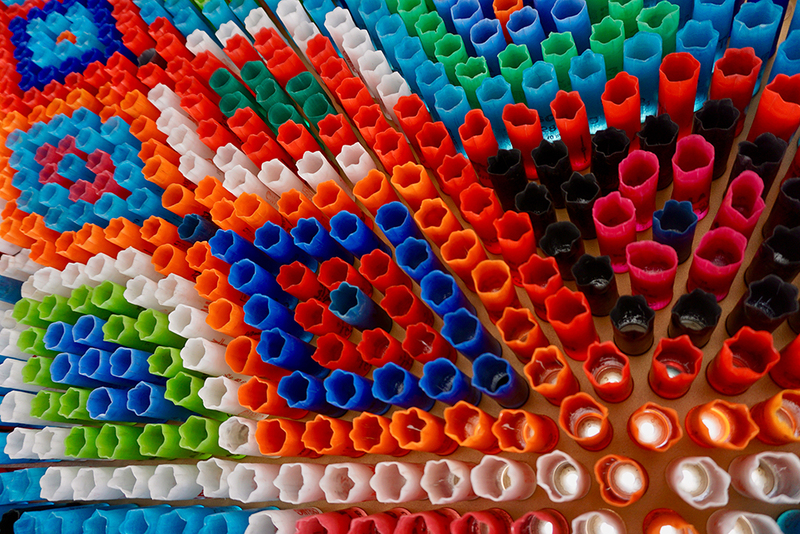 For the moment, 2 triangles are made, with African and South American patterns.